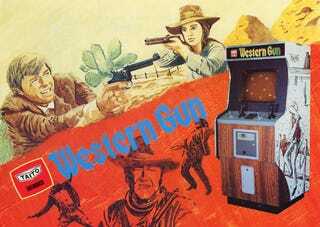 What was the first video game gun? There are three ways to try to answer that question. Originally, when we set out to identify gaming's first gun for our Gun Week here at Kotaku, we looked for the first video game to show a gun. The video game historians we talked to mentioned 1975's Gun Fight. That old game sure does have a gun or two in it. See? But, the experts said, Gun Fight didn't really start it all. Gun Fight was based on Taito's Western Gun. That was a 1975 arcade cabinet as well. It also had a terrific brochure, which appears, along with many others at The Arcade Flyers Archive. But, instead of just looking for a gun in a game, we could look at a gun made for a video game. That brings us back further, to the 60s and Ralph Baer's Brown Box, which later became the Magnavox Odyssey, the original video game console. Baer chronicles the creation of the Brown Box and its gun on his own website. In this image, he shows the Brown Box light gun circa 1968. We could look at that as the first video game gun, but it too has its antecedents. It wasn't the first shooting gallery game gun. No, if you will broaden the category further to allow mechanical games, then you need to go back to the 1920s. that includes a rundown on the many arcade gun games that preceded what we would think of as video games. Some candidates, such as the 1920s Automatic Pistol Range (above), might defy anyone's classification of a "video game," but the site's description of games such as the 1940s Ray Gun (left) help show some very obvious connections between the electric shooting games of old and the ones we play now on our Wii, PlayStation and Xbox. So what was the first video game gun? It depends on how you're asking the question.